We make your matte, reflection-free print using a state-of-the-art, 7-color printing method. White and brighter parts of the image have a subtle sheen. With the aluminum Dibond backing, this print combines high picture quality and perfect durability. Aluminum Dibond is a composite material. It is 1/8” (3 mm) thick and has 3 layers. Two aluminum layers with a platinum white look sandwich a black polyethylene core. The lateral face is black. Your picture printed on aluminum Dibond is a top-grade, robust print with a long lifespan. Due to the low net weight of the material, photos on aluminum Dibond are also fantastic for large formats. The substrate is a sheet of aluminum with a white coating. We print directly on the aluminum using a modern, 7-color technique using top-grade UV Fine Art inks. Colors are highly saturated, even in large monochrome sections. Good tonal gradation ensures accurate reproduction. Direct prints on aluminum are matte and glare-free, but the whites and bright areas have a faint, silky gloss. The light, aluminum material accommodates formats from mini to extra-large. We make customized formats in the exact size you specify. You can set your own proportions. To make sure you can easily hang your aluminum Dibond prints, we include different wall-mounts based on the size. Secure, easy, and included in the price. Of course, you can have your picture made without the hanging hardware attached. All our hanging systems can be used with gallery rails. Our prints on aluminum Dibond always arrive ready to hang: the aluminum rails attached to the back are included in the standard price. You can also have your picture framed to set a custom accent with a visual border. Our frames also arrive ready to hang in both portrait or landscape orientation. We have over 100 frames to choose from. Relaxing in your bathtub at home while gazing at the sunset over the Amalfi coast... impossible? No, it’s not! WhiteWall direct prints on aluminum Dibond are not only water-resistant and fade-resistant, they also offer crisp details – these characteristics make them a perfect decorative object for roofed outdoor areas and bathrooms because they need no glazing and there will be no condensation to mar the view. We have quite a few water-resistant products – our direct prints on brushed aluminum will surprise you with a unique effect: The WhiteWall direct print on aluminum Dibond is printed directly onto brushed aluminum. An eye-catching product for outstanding images. The horizontally brushed aluminum surface shines through in white and very light-colored areas, giving the entire image a contemporary matte look. A metallic sheen appears in the brighter areas. This effect is particularly striking for the presentation of free-standing objects or for images containing metallic surfaces. The WhiteWall HD metal print is also extremely robust and suitable for outdoor areas. This is a premium print option. A state-of-the-art technology called dye sublimation burns your photo into the custom coating of the 1 mm aluminum plate, where it is safely sealed. As a first step, your photo is printed onto transfer paper using Fine Art Inkjet inks. The ink is then steamed into the coating of the 1 mm thick aluminum plate using pressure and heat, fusing the materials permanently. The process is called dye sublimation and allows the rendering of exact details and brilliant colors with excellent durability. 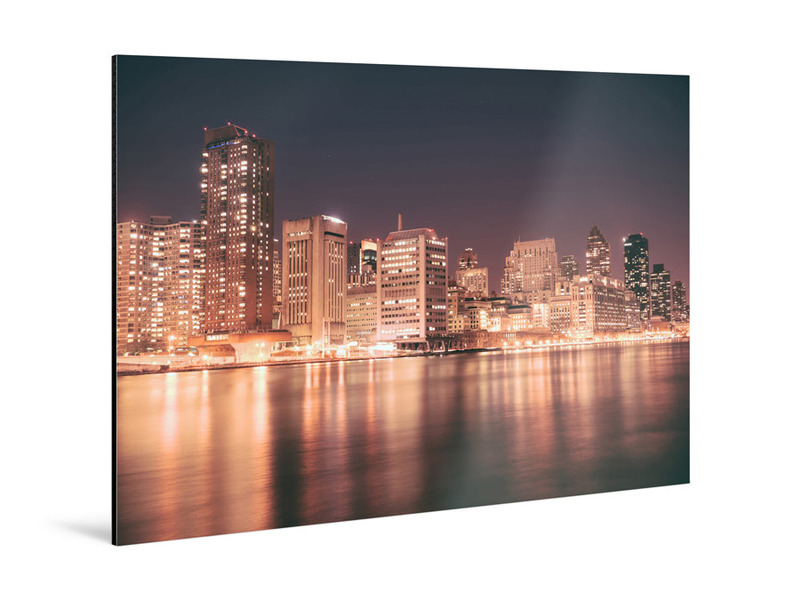 Its glossy look and incredible durability makes the HD metal print a luxurious alternative for the direct print on aluminum Dibond. 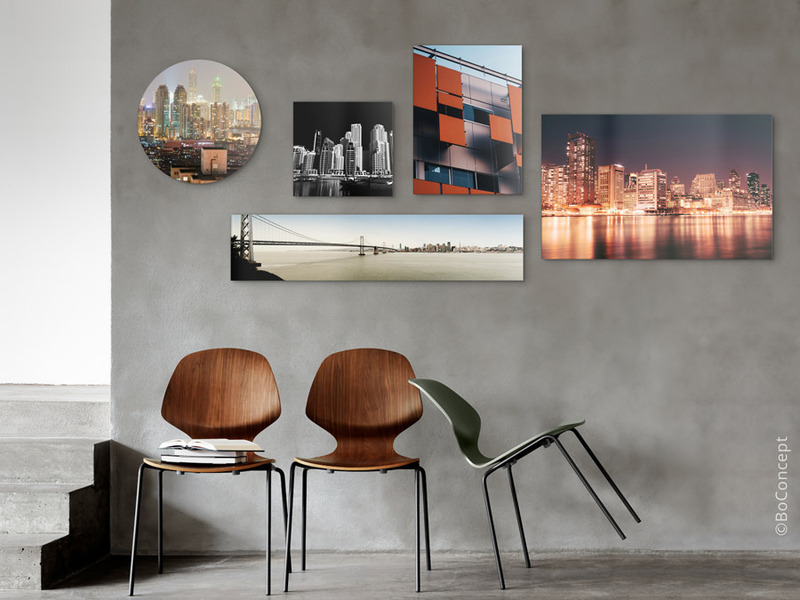 Anyone who values the traditional photo print and is looking for a more contemporary presentation medium will appreciate the original photo print on aluminum Dibond. The greatest advantage: The many artistic possibilities due to the different photo paper types. Select either Fuji Crystal DP II, which is available in matte or glossy, Kodak Endura – also in matte or glossy – or the matt Ilford paper for monochrome prints. 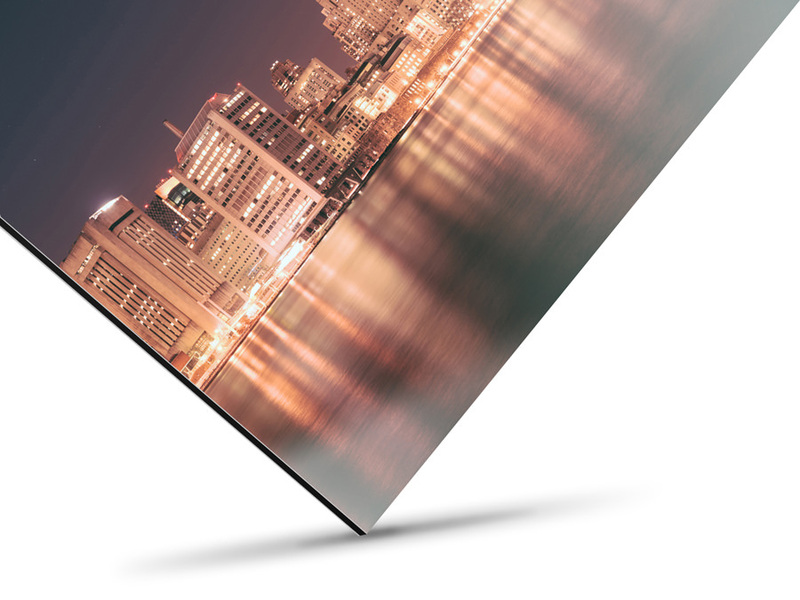 Once exposed, we seal your photo with an ultra-thin protective UV foil in matte or glossy. Your picture is fully protected against dirt and the colors keep their brilliance. 75 years of brilliant colors – guaranteed by WhiteWall. It is, however, not moisture-proof. If you are looking to spruce up your bathroom, a direct print on aluminum Dibond would be the better choice. Or you can just lie back comfortably and enjoy the sunset.